Daisy May grows about 25cm tall and produces large white daisy flowers. SPRING is a great time to inject some colour into your garden. Use a mix of perennial flowering plants that will bloom for years, and annuals that will provide a vibrant burst of colour for one season. You can have great fun with colour combinations. Use warm colours (reds, oranges and yellows) to create a vibrant, exuberant feeling. Try red dianthus, bougainvillea, sunpatiens, petunias, or geranium Big Red for brilliant reds. Begonia Big Red will give you vibrant red in a semi-shaded position. Marigolds and calendula are fabulous yellow-orange annuals, and hibiscus will give longer lasting colour in these tones. Cool colours like purples and blues create a sense of space as well as being more relaxing. You could use a blend of related colours, such as blues, purples, mauves and white to create an interesting yet harmonious display. The new buddleja Buzz series is available in dark purple, paler lavender and white, and plectranthus Mona Lavender will give you purple flowers in the shade. White is always popular for summer as it is so crisp and cooling. White alyssum is lovely and attracts bees for pollination, and white petunias are a summer favourite. Gardenias, camellias and agapanthus are fabulous perennial whites. I'm loving the dwarf shasta daisies that form a low, dense weed-suppressing mat that is covered in flowers from late winter through spring and into summer. 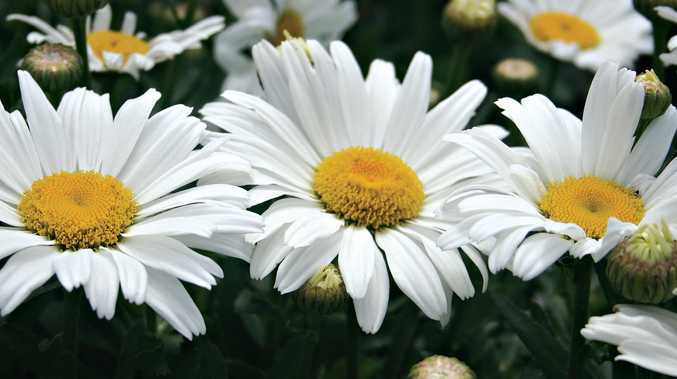 Daisy May grows about 25cm tall and produces large white daisy flowers with a bright yellow centre. Pink is easy - think sunpatiens, petunias, bougainvillea, dianthus, gaura, dipladenia, angelonia and camellias. For semi-shaded areas try medinilla, which has gorgeous pendulous bunches of small pink flowers followed by purple berries. Colour can be great fun. You can plant in a single block of colour, or use a few different shades of the same colour, or be a bit bolder and use complementary colours. Try orange and blue, or purple and yellow. White is neutral and often highlights other colours. If you're planting into a container, make sure you include its colour in the overall scheme too. Yellow and white look particularly good in blue pots, and I always love blue flowers in terracotta pots. Those pansies that you planted in autumn and enjoyed all winter can now be replaced with heat lovers such as petunias, dianthus, salvia, lobelia, marigolds, dahlias, verbena and zinnias. The usual rules apply. Use a premium potting mix if planting in pots, or a soil improver if planting into garden beds. Apply liquid fertiliser fortnightly, and remove spent flowers. Mulch well to suppress weeds and keep the soil cooler.